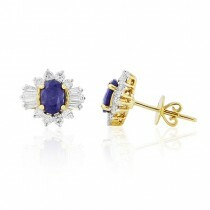 Diamond and Coloured Stone Earrings	There are 18 products. 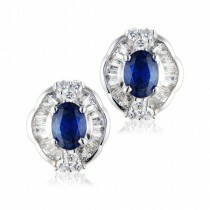 A pair of 9ct white gold earrings each featuring three 3.5mm round brilliant tanzanites with diamond accents. Each earring is19mm in length and has a post and scroll fitting. A matching pendant is available; see 2226272. A pair of claw set oval natural coral cabochon drop earrings enhanced with three round brilliant cut diamonds, all claw set in 9ct gold. A pair of 9ct yellow gold claw set 7x5mm pear shaped aquamarine drop stud earrings with a scroll and post setting. The unusual triangular trilliant cuts of these deep purple amethysts enhance the ways the lilac and violet undertones of these gorgeous gemstones are displayed.. Encased in a halo of white diamonds, all pavé set into 18ct rose gold, each stone measures 6 x 6mm. Post and scroll fittings. A matching pendant is available: See 1050125. 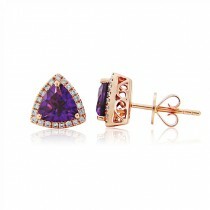 These classic stud earrings feature two 7 x 5mm pear shaped, golden citrines in elegant three claw mounts. A pair of claw set turquoise cabochon drop earrings enhanced with three round brilliant cut diamonds, all claw set in 9ct gold. 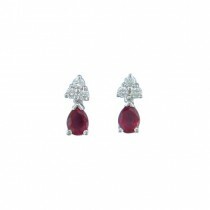 Two evenly matched 5 x 3 mm deep red, lustrous rubies have been chosen to grace these elegant claw set, pear-shaped cluster earrings. Pave set diamonds surround each gemstone to give total outside dimensions of approximately 8.5 x 6mm. The pair has post and scroll fittings in 18ct white gold but they can be made in yellow gold if preferred. A pair of 9ct white and rose gold diamond set drop earrings. A pair of high quality 9ct yellow gold round amber earrings. A pair of oval sapphires weighing 1.00 each and surrounded by channel set tapered baguette diamonds with three round brilliant claw set diamonds at the top and bottom giving a total diamond weight of 1.65cts. Post and scroll fittings. 18ct white gold. Elegant stud earrings trimmed with grain set round brilliant diamonds weighing 0.15cts in total. Dimensions approx h14mm x w 7mm. Gross weight 1.9g.